Since man has been depicting stories through imagery, there have been lessons to be learned within the stories. As far back as 17,000 years ago, in the caves of Lascaux, imagery has aided in the unspoken communication of stories. Before the written language humans told stories that used visual aids to deliver a message. Now these documented scenes that the Magdalenian people left have been translated, thousands of years later, through imagery alone. As artistic talent grew, so did the imageries ability to enhance the theatrics and the stories elaborated. No matter how fanciful or unrealistic the stories grew to be, they were used as teaching tools to help educate society. These stories would teach people about social norms, cultural values, religious beliefs, how to understand the delicate balance between humans and nature, and cope with the inevitable physical phases of maturation. All of which give meaning to the many levels of the human condition. All of these themes reflect in Chambers’ photographs. Three of these themes run deep through Chambers’ photographs. Instilling religious beliefs and understanding the mysteries of life, understanding the delicate balance between humans, animals, and the environment, and the transitions and stages of physical maturation. Now more than ever, both cameras and computers have their hands in the storytelling process. Photography, and its modern sibling Photoshop, have given vast possibilities to what imagination can construct. Through a combination of film and digital photography, Chambers uses the photomontage technique to construct highly manipulated and fanciful images that successfully translate messages to our modern society; a culture that increasingly relights on visual content to communicate. With a background in graphic design, Chambers feels comfortable working with computers and digital editing tools to construct a story and produce his fine art photographs. With a basic idea sketched in his mind, Chambers shoots each image separately then constructs the images together using Photoshop tools. A Nikon digital camera or a medium format film camera is used to capture the imagery. Photoshop, a scanner if film is used, and a Macintosh computer assists in the image making process to produce a final image. Some images are more planned while others seem to unfold subconsciously. Although Chambers uses images from daily life to construct these images he is creating a situation that is not impossible but rather highly improbable. In our highly visual culture, these stories are learned by looking. No real written explanation is needed to explain the content of each image. Even with an ambiguous quality to some of these images, a solid concept can be derived from all of Chambers’ images. A title is added to give the most basic description but after that we are left to our own interpretations and the many layers of conceptual content and cultural teachings. Cameras and computers can only go so far. Imagination, cultural influence, and life’s experiences have to take us the rest of the way so that the message can be fully received. This brings me to the first of Chambers’ running themes; instill religious beliefs and help people understand the mystery of the reality of life. Influenced by the Mexican ex votos, Chambers photographs reference miracles, religion, prayer and guidance. Like the Mexican folk art, Chambers presents his images as a personal offering. Although these images fell personal and close to Chambers, for example the use of his family members in many of the images, the images are also ambiguous enough to send a broader message and evoke a common emotional reaction. It is a common human trait to seek guidance through a difficult time, give thanks for a miraculous occurrence or pray for a loved one to be safe from harm. Take Chambers’ image Black Dogs Retreat for example. 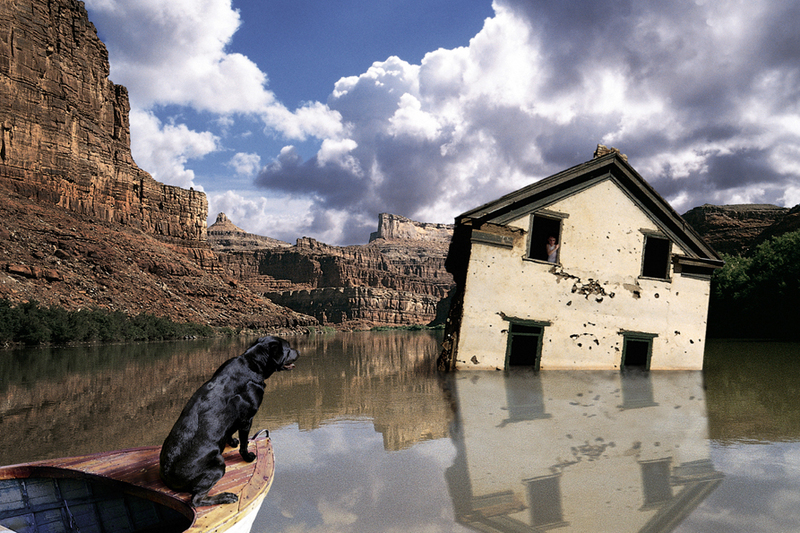 From this collaged tale we conclude that a flood has swept away a home and left nothing but a floating house. Upon closer inspection we notice that a boy has survived the trauma and is peering out the window seemingly unharmed. In the foreground it appears that man’s best friend will be the hero in this story and will come to the rescue of the boy. In a sturdy boat that will surly take the boy to his freedom, the black dog heads for the sinking house to carry the boy to his safety. All of the family’s possessions are assumed destroyed as tragedy has struck but it is nearly unbelievable that the boy was not harmed. Out of destruction comes a thanks for the innocent life spared. A miracle has occurred and Chambers illustrates this in his own ex voto. As long as stories have been told, animals have had a continuous role in teaching humans about their world. In every culture in every part of the world, animals are extremely symbolic and an essential part of man’s stories. 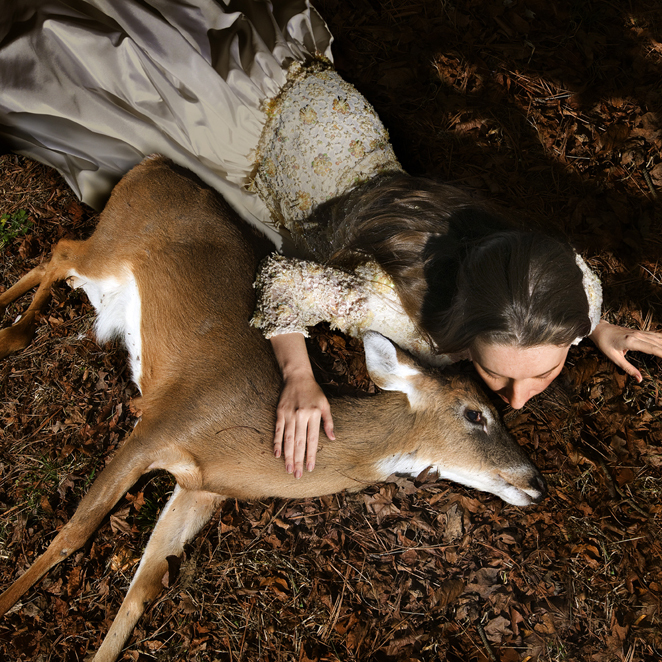 In Ashly with Deer, a young woman comforts a deer as it lays motionless on the ground. The deer is not disturbed by the girl’s presence and as mother earth would gently take the deer in, so has the young woman. 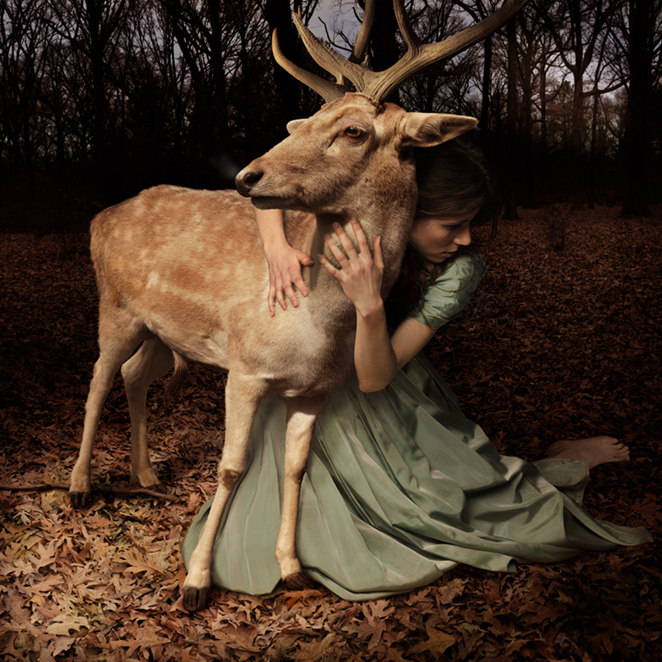 She seems to be whispering something soothing to the deer as they both lay quietly in the dead leaves. There is a calmness in the image but also a sadness as there seems to be a transition and loss that has occurred. Perhaps it is a loss of innocence, a loss of life, a loss of that delicate balance of man and nature, or simply a passing of a season. This concept is depicted again but with a reverse of subjects in Camouflage. This time the young woman is comforted by the buck as she sits beside him, using him as a shelter from an unknown threat. The young buck is strong and confident but the danger the young woman knows is not comprehendible to the buck. Because of this innocence of the animal, there is a sadness in this image. We no longer know who is protecting whom. What we do understand is the eminent danger that is upon them contributing to the disturbance of nature and the unsettled feeling it leaves us. Lastly we look at Chambers depiction of the many levels of transition through physical maturation. The child is becoming the adolescent and the adolescent is becoming the adult. 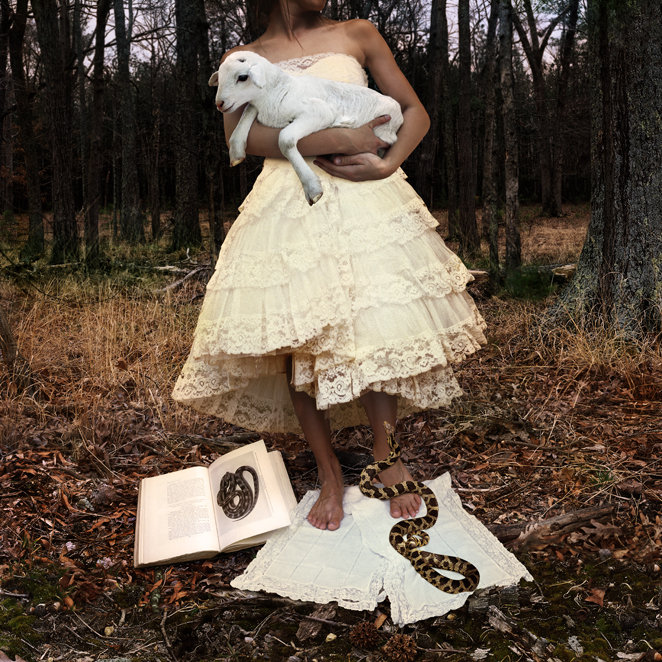 In the image Once Bitten Twice Shy, a young woman stands in a formal gown holding a lamb with a snake and a book at her feet. This woman is anonymous as we do not see her face. She could be any young woman going through this confusing adolescent transition. Her innocence is illustrated by how she cradles the white lamb in her arms. This young innocence is what she clings to as the adult world slowly creeps up on her. The snake at her feet is not violently threatening her but rather an uncomfortable dissonance to the innocence surrendered. As she stands on the book, which symbolized the knowledge of the adult world, she hesitates for the inevitable. The changes to come cannot be learned in a book, rather she alone must take the transition into adulthood and uncomfortable as it may be, leave her adolescence behind. The stories that Chambers presents are stories that are unspoken and understood on many levels. The goal of these images are to inspire by instilling a sense of magic and wonder, illustrate the mysteries of our world and tell the stories that teach our culture without words. These are not new stories but rather old stories shown in a new way; presented for the current time and illustrated so that our modern visual culture can comprehend the messages. As time evolves, stories will be passes on through new mediums. With a new way of learning and new way of teaching, Chambers is making his creative efforts to show the next generation of visual learners the values, myths, and miracles of our world and give a visual aid to the contemporary human condition just as it has been done for thousands of years.